Tuseday to Friday 5:00- - 7:00 PM. We offer 15% family member discount. • All teachers are native Chinese speakers. 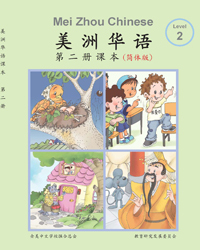 • Introduction to Chinese (Mandarin) Language along with learning about the Chinese culture. Teaching easy dialog, numbers, colors, animals, family members, characters, and simple conversations. • Using Chinese folk songs and dance, Chinese Yo-Yo and dancing handkerchief to help make learning fun. We also draw pictures and play group competition games to help children retain and better understand these lessons. • Students will master the language while they have fun. 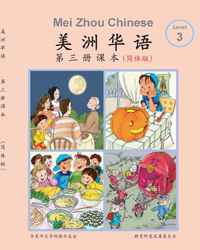 Students will use Meizhou Chinese level 1-3 depends on their Chinese level. Multiple classes may be offered depends on the number of enrollments. With 3-day weekly schedule, students are expected to finish their level Meizhou Chinese in one and half years. 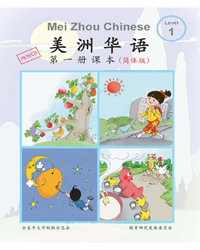 After finishing each level of Meizhou Chinese book, the students will have opportunities to take YCT (Youth Chinese Test). It is a standard Chinese tests administered by the China Education Ministry. YCT (Level 4) 600 Students who pass YCT-Level 4 can use Chinese to serve their demands in their personal lives and studies, and are able to complete most of the communicative tasks they experience during a visit to China. The exam includes a listening section, a reading section and a writing section and is 80 minutes in length. YCT (Level 3) 300 Students who pass YCT-Level 3 can use Chinese in a simple and direct way, applying it in a basic topic in their daily lives. The exam includes a listening section and a reading section and is 55 minutes in length. 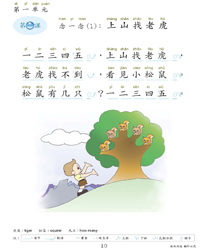 YCT (Level 2) 150 Students who pass YCT-Level 2 can understand and use some simple Chinese words and sentences to communicate. The exam includes a listening section and a reading section and is 45 minutes in length. YCT (Level 1) 80 Students who pass YCT-Level 1 can understand and use some most frequently used Chinese words and sentences, and prepare themselves for continuing their Chinese studies. The exam includes a listening section and a reading section and is 30 minutes in length.